This hugely diverse museum contains some world-class attractions among its dusty relics and stuffed animals. The facility is home to the great pre-historic finds from the Leakey family, including relics from mankind's earliest ancestors. The most famous fossil in the museum is the skeleton of Turkana Boy, the most complete early human skeleton ever found, at 1.5 million years old (Turkana Boy is officially classified as either homo erectus or homo ergaster). There are also fascinating sections on art, geology, wildlife and local history. 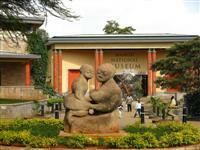 The Nairobi National Museum is a nice looking building with lots to offer visitors. In many ways it is a bit old-fashioned, but it is a great place to learn about Kenya's culture and history and a worthwhile attraction for visitors to the city. Local guides are available at the museum and hiring one is a good idea because their knowledge enriches the exhibits and fills in any gaps there may be in information. Apart from the wealth of artefacts and information in the museum, there are some wonderful sculptures and a herb garden in the grounds, and there is an attached snake park where some of the world's largest and also most venomous snakes are displayed, in addition to other animals like tortoises and crocodiles.